Geez, as a word nerd, I thought I had it all right. Wrong! Acai (as in the berry) is pronounced ah-SIGH-ee. I also was certain I had moussaka right, but apparently true foodies and chefs know it’s pronounced moos-ah-KAH. Who knew. Uranus, I was assured, is NOT pronounced yer-AY-nus. And I finally learned how to pronounce the surname Nguyen correctly. 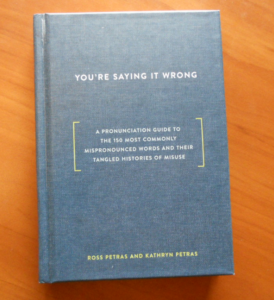 Ross and Kathryn Petras, the authors of You’re Saying It Wrong, have rounded up some of the most misunderstood words and phrases in the English language. 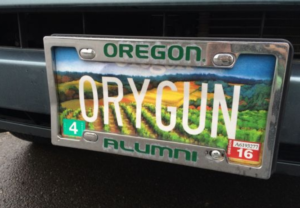 And, thank the Lord, the book also includes Oregon, the most abused and mispronounced state name in politics and newscasting. Each page gives a quick definition and pronunciation plus a few paragraphs explaining the source of the word, the pronunciation, or the confusion. So you’ll learn why we say woulduv, but should write would have, and why the Samoan island of Pago Pago is pronounced pongo pongo. Throughout the book there are little blue pages called “How to sound like …” with a quick list of words that help you sound like a wine connoisseur, a patron of fine arts, a fashionista, or a dozen other groovy things. The authors don’t take themselves (or anyone else) too seriously though—it’s a fun little book to browse through and keep handy for reference. Why Aren’t You Writing About …?? I’ll Tell You.